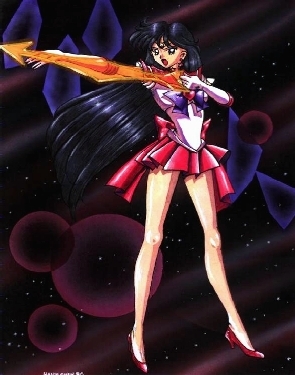 " I will punish you in the name of Mars!" Rei loves to be the center of attention.She has a very fiery temper, and she and Usagi are almost always arguing with each other. It is obvious from the start that Rei is jealous of Usagi's role as Princess and leader of the senshi but she comes to realize over time that Usagi is the only one who can rightfully fulfill that role. Usagi and Rei have what could be called a "tough love" relationship. There are times when Usagi needs a good swift kick in the rear (or slap in the face) to keep in line, and most of the time Rei is the only one who dares to give it to her. However, the two of them definetly share the sisterly bond that runs between all the senshi, and when it comes right down to it, Rei's devotion to Usagi is unquestionable. When Usagi needs her, Rei will come running. She goes to T*A Private girls school. Raye's majorly popular at her school. Rei has guts! Fugu, if not cooked and eaten correctly, is poisonous. Raye's boyfriend is Kumanda Yuuichirou (Chad). Raye's Mom died when she was very young and her Dad's a politician. Her castle is the Phobos Deimos castle. Phobos and Deimos are the name of Raye's crows. Which are also the names of the moons around the planet Mars!